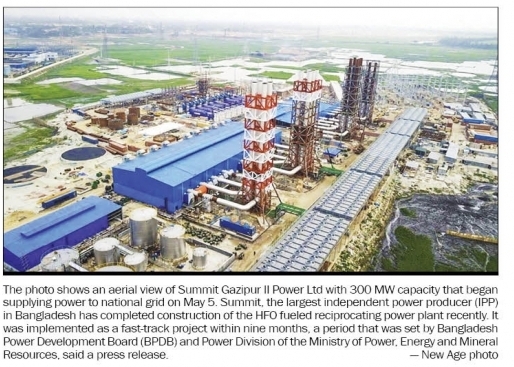 Photo caption: Summit Gazipur II Power Ltd with 300 MW capacity begins operation in nine months since receiving LoI. Summit, the largest Independent Power Producer (IPP) in Bangladesh has completed construction of another HFO fueled reciprocating power plant with 300 MW capacity. 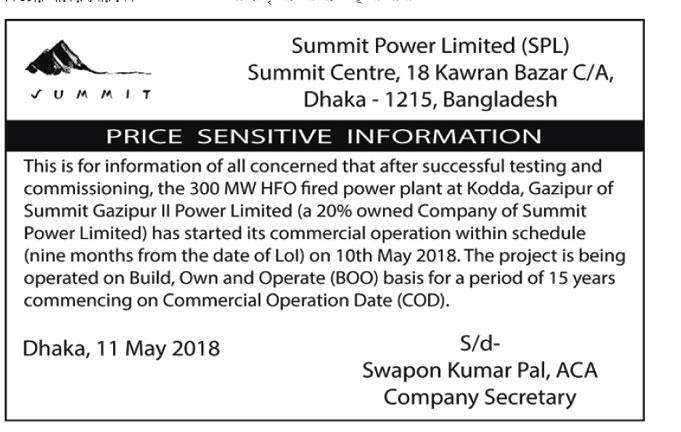 The Summit Gazipur II Power Limited has begun supplying power to the national grid from 5th May 2018. It was implemented as a fast-track project within nine months, a period that was set by Bangladesh Power Development Board (BPDB) and Power Division of the Ministry of Power, Energy and Mineral Resources. Summit Gazipur II Power Limited is a joint venture of Summit Corporation Limited and Summit Power Limited (SPL). The Letter of Intent (LoI) of this 300 MW power project was issued on 10th August, 2017 and consequently the Power Purchase Agreement (PPA) and Implementation Agreement (IA) were signed with Bangladesh government for a period of 15 years on 10th December 2017. Summit Gazipur II Power is located in Kodda, Gazipur about 30 km away from Dhaka city. The power plant is supplying power at 230 KV to Tongi and Kaliakoir grid sub-stations.